Now I'm no skincare expert, but over the years that I've been following a regular skincare routine I have learned a lot about the different ways you can cleanse, tone and exfoliate your skin. Exfoliating is one of my favourite steps in any routine as it makes my complexion appear brighter, clearer and less dehydrated. Today I am sharing with you three ways I like to exfoliate and the different products I use. Use A Face Scrub | When I think of exfoliating, my mind always wanders to face scrubs. They're perfect for when you want a quick fix; scrubbing away any dry patches and promoting a radiant, glowing complexion. The Pixi Peel and Polish is the perfect hybrid between scrub and mask as the enzyme peel can be left on for a more intense treatment if the scrub doesn't quite cut it. Too much scrubbing can can cause skin problems if used too frequently, so if you want a gentler option then I would recommend using a muslin cloth with a cleanser to lightly scrub away dead skin and patches. Using Glycolic Acid | Although I love a good face scrub to instantly make my skin feel soft, smooth and glowing, I do reach for a glycolic acid to lightly exfoliate and brighten the complexion on a day-to-day basis, especially when I don't want tor each for anything too abrasive. 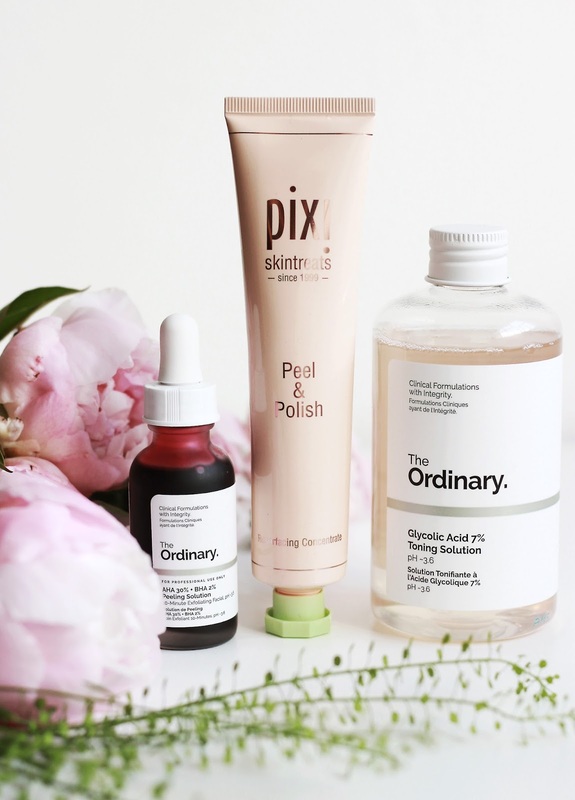 I love using The Ordinary's Glycolic Acid Solution; a simple formula that does the job and is comparable to Pixi's Glow Tonic. However, having used both, I have noticed that the latter treats blemishes a bit better; probably to do with the witch hazel ingredient. Now, I've got sensitive skin and I've never had a problem with using chemical exfoliant besides making my skin tingle, but it's important to note that acids can make your skin sensitive and more prone to sunburn, so steer clear of these if you know you're going to be in the sun all day. An Exfoliating Face Mask | I have quite a well established skincare routine which is perfectly tailored to all my skin's needs and I feel like it serves me well. Every once in a while, I opt for a face mask to either inject a boost of hydration to the skin, to promote radiance or just to prep my skin ready for makeup. An exfoliating face mask can do my skin all sorts of wonders in a matter of ten minutes. I've been using The Ordinary's Peeling Solution, a liquid that resembles blood both in consistency and colour, but after just one use my skin was transformed. It's one of my favourite ways to use a mask as the lightweight formula gets to work quickly and in the next 24 hours after use, my spots were brought to the surface and my skin appeared brighter. If a scrub style mask floats your boat, I really enjoy using the Origins Original Skin Mask*. What are your favourite ways to exfoliate?